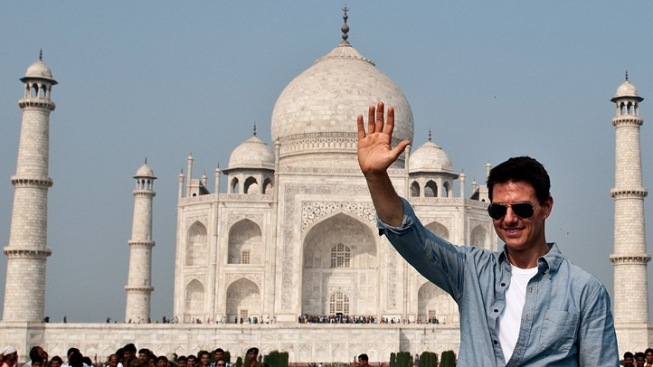 Star focus of attention on trip for "Ghost Protocol"
Tom Cruise poses at the Taj Mahal in Agra on Saturday. Sporting a big grin and sunglasses, the Hollywood star, who is on a worldwide promotional tour for his fourth "Mission: Impossible" movie, told reporters in the Indian capital he was "very excited to be here" as cameramen jostled to film him. Tom Cruise is thrilled to be seeing India for the first time. "I wanted to come to India my whole life, so I am very excited,” the Hollywood star told Press Trust of India Saturday, as he visited the iconic Taj Mahal in Agra. Kapoor was even more effusive, saying that Cruise was “absolutely mesmerized” by the Taj. Tom Cruise's fourth installment of the high-flying spy thriller franchise is now on home video. "MI:4" co-stars Jeremy Renner, Simon Peg and Paula Patton, and is directed by Brad Bird. "He found it incredible. He loved the fact that such a monument could be built in the 15th century. He loved every moment of it,” said Kapoor, who has a cameo role in “Ghost Protocol.” He hosted an exclusive party for Cruise Saturday night at the Taj Mahal Palace that was attended by Bollywood A-listers. According to The Hollywood Reporter, Cruise is staying at the Mumbai hotel, which was severely damaged during the 2008 terrorist attacks. The 108-year-old hotel was restored to its former glory and reopened last year. In the fourth “Mission: Impossible” movie, Cruise’s secret agent Ethan Hunt is blamed for a terrorist bombing of the Kremlin. The action thriller is directed by Brad Bird, who won Oscars for his animated films “Ratatouille” (2007) and “The Incredibles” (2004). 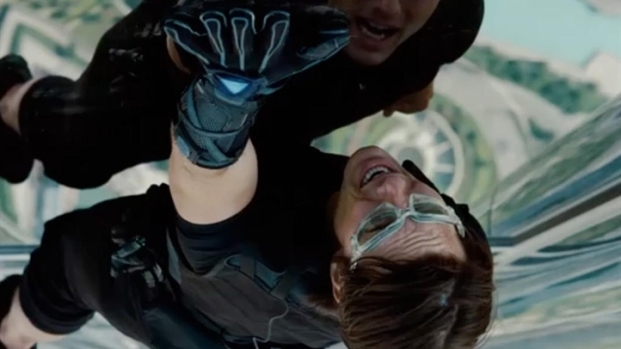 After a special screening, Cruise, 49, is expected to depart Mumbai late Sunday for Dubai, where “Ghost Protocol” has its world premiere Wednesday. It comes out in India Dec. 16, and in the U.S. on Wednesday, Dec. 21.